This was sort of a no-brainer pick for the winter solstice, which arrived Thursday afternoon on the 21st. Here in southern Vermont we didn’t need a calendar, or a beer, to know that winter had arrived. We had about ten inches of snow the week preceding, another major dump a day after the solstice, and more predicted for the days ahead along with a wicked cold snap. All a little extra punctuation to the longest day of the year. All good, of course, since it means the days are beginning to lengthen again. 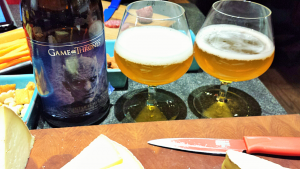 What was really needed was someone to explain “Game of Thrones” to me, and who was the devious looking character on the label of this latest collaboration between Brewery Ommegang and HBO Global Licensing, HBO being the producers of the continuing fantasy tale based on the novels of George R. R. Martin. I may as well confess that I’ve read not a single word of Martin’s work, nor seen a second of the television series, not that I have anything against either; we just don’t get HBO. I am fairly well-versed in Shakespeare, and I brought the bottle along to our more or less monthly get-together of the group that meets to read the Bard’s plays, and has been doing so for more than 20 years. Only a few of the regulars showed up that night and only one of those, Vince Panella, had ever seen “Game of Thrones.” Vince, an author in his own right, admitted he was mostly taken in by attractive women riding around on dragons. Well, no more confusing to me than “Measure for Measure” might be to someone who has never read Shakespeare. We speculated for a bit whether more people have seen “Game of Thrones” than have ever viewed Shakespeare’s plays. Given the reach of modern TV, it seemed plausible, for a moment. But then I reasoned that Shakespeare has had his own pretty good run in film and television, and his influence seems unlikely to wane. Of Martin, who can tell? 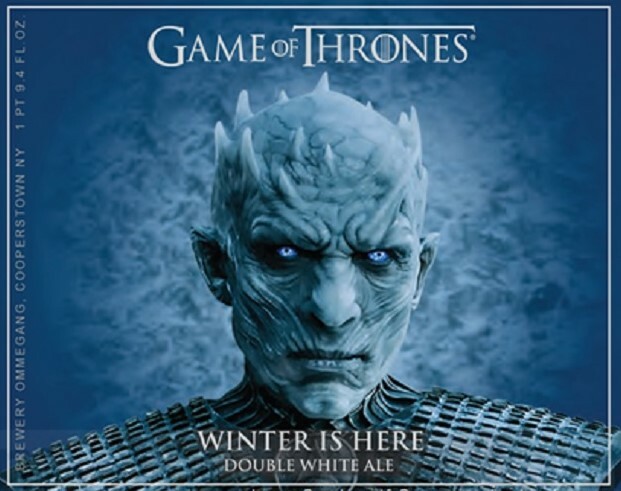 Certainly Ommegang has, so far, made more “Game of Thrones” beers (nine) than Martin has written books in the series (five), with plans for more special edition brews in 2018, even as the show winds to a conclusion. I’ve had one or two of the others in the beer series along the way (don’t quiz me on it), since I like pretty much everything out of the Cooperstown, New York brewery (by way of Belgium). In any case, it’s nice to be able to say you don’t need to know a whit about “Game of Thrones” to enjoy Winter Is Here, and it would surely be just as drinkable in warmer climes as in Vermont’s current deep chill. There’s a lot going into the brewpot for this one, Pilsner and wheat malts, red wheat flakes, Saaz hops and a number of extras–white pepper, sea salt, coriander and sweet orange peel. Sounds like a Wit, all right, except that it emerges at 8.3% ABV, putting it into a category—Double White—that despite a few examples over the years, doesn’t even exist on most beer style charts. So how does it taste? Pretty damn good. 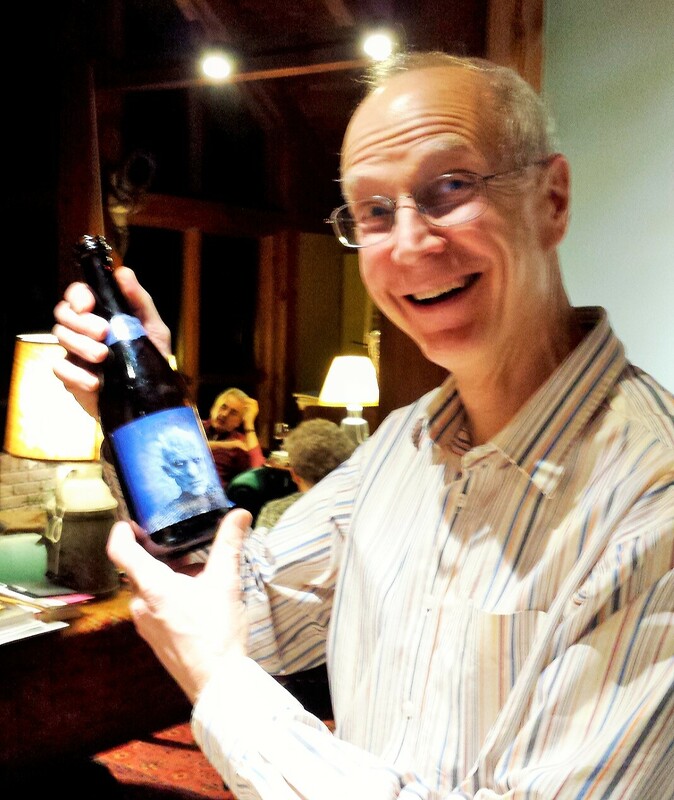 Vince doesn’t even drink beer often, but Tim Shafer does and he said of the beer, “I am in favor.” Later the Belgian quality of the brew began to wear on him, though, and he seemed to be falling a little out of favor. I was in all the way. There was indeed a spicy, peppery quality to the beer that, added to its lively effervescence, made it roundly refreshing. If light and clear, a rogue boozy note was apparent, along with floral and fruity impressions of pear and peach. The more I drank it the more 1) I liked it and 2) it reminded me of Duvel, the parent company’s flagship strong blonde ale, as opposed to a stronger version of a witbier. Well, it’s the house yeast, after all, and being reminded of a Duvel can never really be considered a drawback. Sorry about the dragon, though. Availability: Now, until it runs out, in 42 states and Washington, D.C.